Browse this item in booklet form by clicking on the image, above. 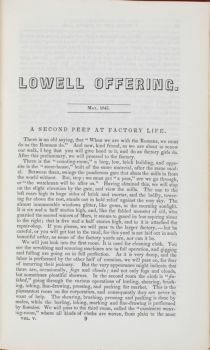 This article is the second installment of a series by mill girl Josephine L. Baker and printed in the 1845 edition of the Lowell Offering. The piece details an imaginary trip through the daily workings of a mill and the atmosphere of its workers. This article provides us with not only a firsthand account of a mill, but also how it would have appeared to an outsider, anticipating his or her reactions. It captures the pace of work, the immense size yet cramped conditions of the mill, the varied kinds of work conducted on each floor, and the women’s exhaustion at the end of the day. While Baker praises the opportunities for self-improvement, such as lectures or classes, she bemoans the lack of time available for such pursuits. For more information, see the AAS catalog. 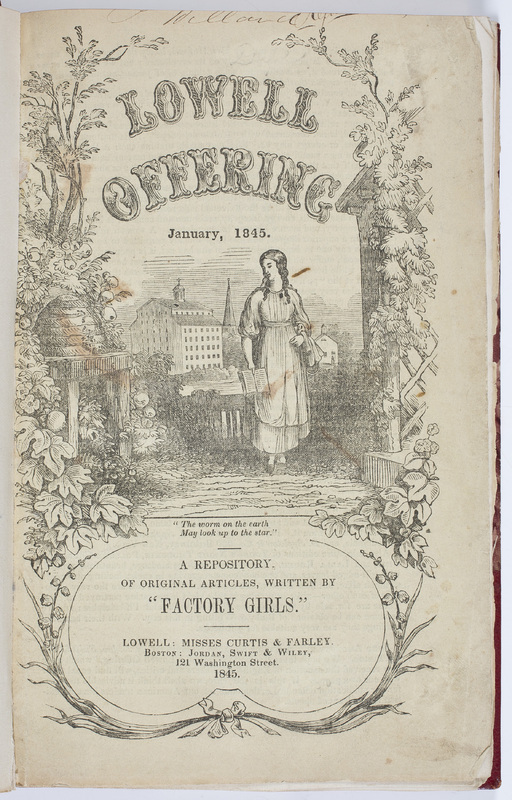 Josephine L. Baker, “A Second Peep at Factory Life,” Mill Girls in Nineteenth-Century Print, accessed April 21, 2019, http://americanantiquarian.org/millgirls/items/show/38.